Max for Live lets you build your own devices for use in Live. 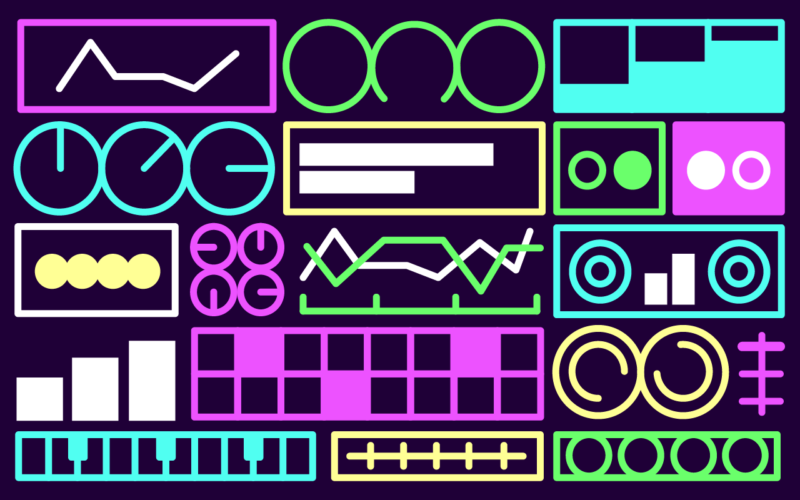 Create custom synthesizers, samplers, sequencers, audio effects, and much more. Max for Live also allows you to build devices that modify Live itself, including the properties of tracks, clips, and native Live devices. Palmas is a device solely for synthesizing claps. It has up to 32 pairs of hands to make anything from a lonely person clapping to a large group of people clapping. There are parameters to control stereo position, velocity, playback speed, and attack. This allows deep control over the timbre of the clapping. One fun feature is if you hover over the parameters you are greeted with 4 different philosophical quotes. Vizzable is an incredibly fun video effect that will take your webcam and transform live video into mesmerizing patterns. There are tons of visual effects including a slicer, kaleidoscope, fisheye, blurrer, and much more. Analog Kick is an amazing device just for creating synthesized kicks. There are parameters to sculpt the amplitude envelope, frequency, distortion, and EQ. You can also mix between the Beater (the object that strikes the kick) and the Oscillator. Analog Kick also allows frequency modulation and has an A – B slider to morph between 2 presets. There are 21 presets to get some good starting points. One of the challenges programming drums and other instruments is the absence of human feeling. Group Humanizer is a great tool that “humanizes” MIDI tracks by adding variances to the timing of your MIDI patterns. The real power of Group Harmonizer is its ability to humanize multiple (up to 10 ) tracks at once. With special parameters like “listening” and “influence”, different tracks can influence each other / be influenced by each other through the MASTER device (shown below). Everyone’s heard it…the classic wind down or “tape stop” effect. Tape Stop 2.0 is a simple but effective tool to create this classic wind down effect. You can control the length of stop by time by ms/seconds or sync to your DAW and set the length by beats. There are also “Up Time” parameters to sculpt the timing as the audio winds back up to normal speed. There are a lot of Max For Live step sequencers, Advanced Step Sequencer is great because of the balance of functionality and simplicity. It is pretty fast to draw in patterns under the Pitch Panel and the Octave/Velocity panels add extra control. One of the best features is the scale tool, which will allow you to make patterns adhere to different scales. The Control panel is also a great way to quickly shift the patterns around. Architect is a device similar to the stock LFO from the Max for Live Essentials but improves on several features. Architect gives you the option to switch between MIDI (one shot envelope mode) or Loop (repeating LFO mode). The best part is the ability to draw your own shapes in the main window. Good panning techniques and stereo imaging can set your production apart. Circular Doppler is an amazing device that allows you to modulate the stereo signals in a rotating doppler effect. This really conveys the feeling that the audio is rotating around you versus traditional panning automation. Think of Circular Doppler as 3D vs traditional panning as 2D. There are parameters to meticulously design the Doppler effect as well as where the listener is in relation to the moving sounds. Motion Mod really shows off the interactive prowess of Max for Live devices. This device allows you to use your webcam to track the amount of motion at any given time. You can map the Motion Mod device to any parameter. In this case, I chose the Frequency parameter of an Auto Filter. This device is definitely geared towards live/interactive sets but it is super fun nonetheless. An oscilloscope is a tool used to observe the change of an electrical signal over time. In this case, we are able to measure a sound wave’s amplitude, frequency, and rise time. Jo Floating Oscilloscope is a must have for anyone getting deeper into sound design. It features a detachable floating window, an X-Y controller to control the Buffer/ Gain size. This device is very useful on synthesizers, it will let you visualize the sound you are designing.